It is ideal as a warming and nourishing starter for those dinner parties that require a wow factor, or it is a great lunchtime or light evening meal that will leave you feeling thoroughly nourished and restored. A perfect autumn treat as the weather gets cooler and we need to start conserving our vital energies ready for winter. Read below for this delicious recipe. Sauté the onion in olive oil until soft. Prepare butternut squash, peel and chop into chunks and brown in the pan with the onions. Add a cup of cold water and put the lid on to simmer for half an hour. Meanwhile, grate the ginger, chop lemongrass and garlic (add fresh chilli here if desired but as this is an Ayurvedic recipe I have left it out). Alternatively you could use a food processor to chop these ingredients finely with a little olive oil. Once the butternut squash has softened, add the coconut milk, and stock and then blend. More liquid can be added at this stage if needed although it is nice to have a thick soup. Return to the heat and add the chopped ginger, lemongrass and garlic, cook for a further five minutes. It has a delicious creamy texture that people love. 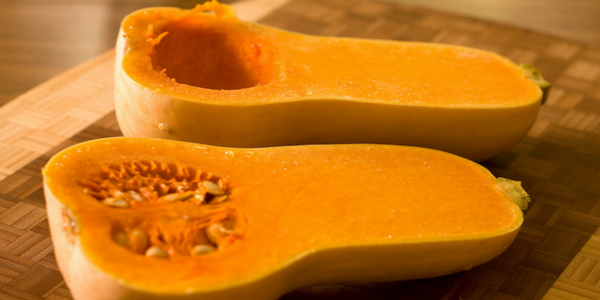 Butternut squash is technically a fruit, however it is served as a vegetable in main dishes. Just one cup of butternut squash provides more than 500% of your recommended daily intake of vitamin A, a beneficial nutrient for improving eye function and vision. 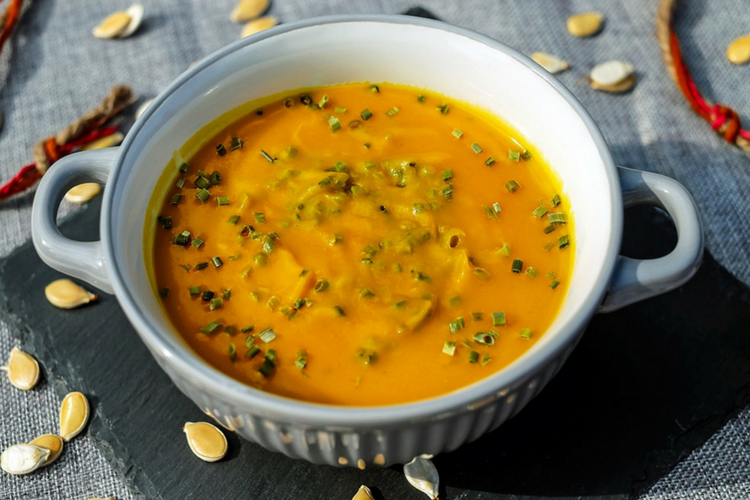 One cup of butternut squash also provides nearly 100% of your recommended daily intake of vitamin C, a powerful antioxidant that boosts your immune system. The squash is also high in vitamin B6, which strengthens the nervous and immune systems, and potassium, an important nutrient for healthy bones. Butternut squash is also quite healthy for pregnant women because it contains folate – a nutrient that helps protect against certain birth defects. It contains no fat, cholesterol or sodium, all of which are dangerous for the heart and cardiovascular system when consumed in excess. So have a play making this delicious soup and wow your friends and family…and it is so simple! If you liked this soup, why not try our delicious autumnal pumpkin pie recipe?